Recently opening in suddenly trendy Atwater Village is Village Tavern, featuring a menu that fuses Mexican and all-American barbecue in dishes like chorizo-spiced pulled pork tacos or smoked barbecued brisket burritos. Also available are beer-battered avocado fries or jalapeño rings to pair with burgers, nachos or wings. About a dozen craft beers rotate on tap, along with 50 in bottles and cans. Dinner Tues.-Sun. Village Tavern, 3218 Glendale Blvd., Los Angeles, CA 90039, 323-644-0605. Eagle Rock’s family-friendly spot Little Beast now prowls in the craftsman bungalow that formerly housed Larkin's. Husband-and-wife team Deborah Schwartz Lowenthal and Sean Lowenthal (Chateau Marmont) offer a menu of small plates including wild salmon tartare with kumquat, burrata and peach salad, and roasted organic chicken. A kids' menu features burgers, quesadillas and pasta. The international wine list has some organic and biodynamic labels; also, find craft beers and rotating drafts. Dinner Tues.-Sat. Little Beast, 1496 Colorado Blvd., Los Angeles, CA 90041, 323-341-5899. Look for authentic Filipino street food like pork sisig (pork belly and ears), kwek-kwek (buttered quail eggs), pancit noodles, goat stew, chicken soup with Asian herbs, and fish balls at Kalye Hits, located off the 101 freeway at Barham on Cahuenga Boulevard in Hollywood. Lunch & Dinner Tues.-Sun. Kalye Hits, 3173 W. Cahuenga Blvd., Los Angeles, CA 90068, 323-512-4487. The folks behind Le Ka have opened EMC Raw Bar & Seafood in K-town. The sleek, modern room offers a Cal-Asian menu focusing on fresh seafood, ranging from raw oysters, steamed clams and clam chowder to crab, lobster, fried catfish, pasta and a seafood stew. Dinner nightly. 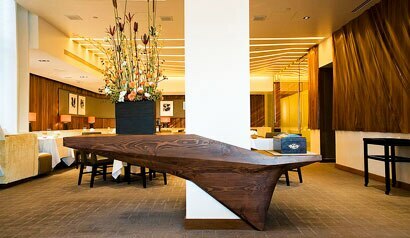 EMC Raw Bar & Seafood, City Center, 3500 W. 6th St., Los Angeles, CA 90020, 213-351-9988. Visit Marugame Monzo in Little Tokyo for handmade udon. Udon fusion styles range from carbonara to uni cream, while the traditional bowls come both hot and cold. Also, find rice bowls with ikura and pork belly, and dinner items including skewers, tempura and scallop carpaccio. Lunch & Dinner daily. Marugame Monzo, 329 E. First St., Los Angeles, CA 90012, 213-346-9762. Chef Brian Malarkey, who operates Herringbone, Searsucker and Gabardine in the San Diego area, will open Herringbone at the Mondrian Los Angeles. It will open in January 2014 in the space that currently houses Asia de Cuba. Herringbone, Mondrian, 8440 Sunset Blvd., West Hollywood, CA 90069, no phone. The dining options at Los Angeles International Airport will significantly improve with the opening of chef Mark Peel's Campanile, which is scheduled for Fall 2013. Los Angeles International Airport, Terminal 4, Los Angeles, CA 90045, no phone. State Social House made its debut on the Sunset Strip on August 28, 2013, replacing Red Rock Eatery and Isla Cantina. The three-level venue offers a gastropub menu from executive chef Vernon Cárdenas with options like Niman Ranch pork belly tacos. 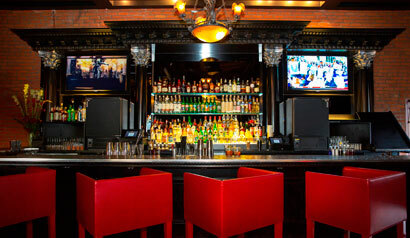 State Social House, 8782 Sunset Blvd., West Hollywood, CA 90069, 310-657-8100. The Pasadena location of Coolhaus debuted in Old Pasadena August 2 --- National Ice Cream Sandwich Day. The innovative ice cream truck, which previously morphed into a brick-and-mortar establishment in Culver City, expands to the Rose City with its famous skyscraper-style ice cream sandwiches, shakes and exotic ice creams like fried chicken and waffles, Guinness chip, and mango-saffron sorbet. Open daily. Coolhaus, 59 E. Colorado Blvd., Pasadena, CA 91105, 626-486-2700. Eric Greenspan is opening Greenspan’s Grilled Cheese next to his restaurant The Foundry (which is still under renovations) this fall. The casual eatery, designed by Spacecraft, will feature a long counter, and guests can expect a menu of highly inventive grilled cheese creations. Greenspan's Grilled Cheese, 7465 Melrose Ave., Los Angeles, CA 90036, no phone. Lou Amdur (Lou) has partnered with Jessica Koslow of Sqirl to open Lou’s Wine and Provisions annexed right next door, and sharing an adjoining kitchen that will produce artisan charcuterie and pickles, in addition to Koslow’s cult-favorite jams. Amdur’s market will also offer breads, cheeses and exotic canned items, along with an affordable selection of wines all under $25. Breakfast & Lunch daily. Lou’s Wine and Provisions, 720 North Virgil Ave., Los Angeles, CA 90029, 213-394-6526. Restaurateur Bill Chait (Rivera, Bestia) and chef Walter Manzke (Bastide, Church & State, Petty Cash Taqueria) will open their new bistro Republique in the former Campanile space in winter 2013. Manzke also plans to open a bakery-cafe with his pastry chef wife in the connected storefront, which was Nancy Silverton’s original flagship La Brea Bakery. Republique, 624 S La Brea Ave., Los Angeles, CA 90036, no phone. Three’s a charm for chef Josef Centeno (Baco Mercat, Bar Ama), who’s about to open a third eatery downtown. Orsa & Winston will debut in the fall next to Centeno’s Tex-Mex Bar Ama, with a menu featuring Italian small plates. Orsa & Winston, 122 West 4th St., Los Angeles, CA 90013, no phone. In Malibu, chef Chris Bocchino (Terra) is dishing up elegant Cal-Med fare at V’s Restaurant + Bar in the former Charlie’s space. Expect flatbreads, pizzas and pastas, as well as entrées like wild sea bass with cauliflower ragout and filet mignon with a mushroom demi-glace. Also, find fresh signature cocktails and a boutique wine list leaning towards the West Coast and local wineries. Dinner nightly. 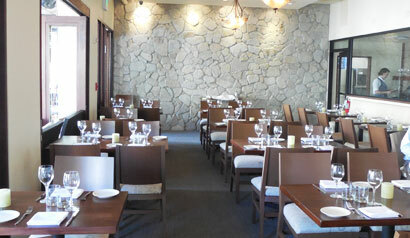 V's Restaurant + Bar, 22821 Pacific Coast Hwy., Malibu, CA 90265, 310-456-3828. In September, Pasadena will welcome Grist & Toll, L.A.’s first “urban flour mill,” a venture of Marti Noxon and Sweet Butter pastry chef Nan Kohler. Locally sourced grains will be ground on site and sold to area restaurants and bakeries. Retail customers are also welcome to pick up small-batch flour and freshly baked bread. The actual mill is being imported from Austria. Grist & Toll, 990 S. Arroyo Pkwy., Pasadena, CA 91105, no phone. Downtown L.A.’s new cocktail and dining experience Ebanos Crossing is serving up handcrafted spirit-focused libations created by mixologist and beverage director Philip Ward (co-owner of Mayahuel in New York.) The bar/restaurant spotlights the spirits encountered on smugglers' routes forged during the '20s and '30s along the South-central Texas crossing from Mexico to the United States, with signature cocktails like the “Bear Flag Revolt” with rye whiskey, mezcal, cocchi torino and Benedictine, among other ingredients ($12). Culinary offerings highlighting the epicurean identity of the region feature baked oysters with habanero lime butter and adobo sauce; medianoche sliders with braised pork, black forest ham, smoked gouda and maple mustard; and paella with mussels, clams, shrimp, chorizo and jasmine rice. Dinner Tues.-Sat. Ebanos Crossing, 200 S. Hill St., Los Angeles, CA 90012, 213-935-8829. The former Manhattan Beach space of Mr. Cecil's California Ribs will be transformed into The Rockefeller. 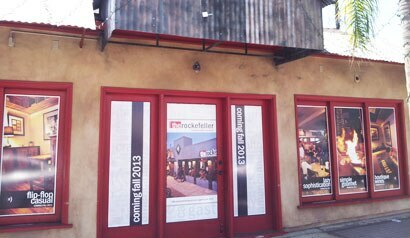 This second branch of the Hermosa Beach gastropub is scheduled for a Fall 2013 opening. The Rockefeller, 1209 Highland Ave., Manhattan Beach, CA 90266, no phone. In the former Xino space in Santa Monica Place, the indoor/outdoor Redwood Grille now perches above the Third Street Promenade. Expect an American menu featuring steaks and burgers, lamb, chicken and fish, as well as other seafood like grilled octopus and a lobster grinder. Lunch & Dinner daily. Redwood Grille, Santa Monica Place, 395 Santa Monica Place, Santa Monica, CA 90401, 310-576-0600. Downtown’s Grand Central Market now boasts authentic Texas barbecue at Horse Thief. The house specialty is pork spare ribs, but other temptations include chicken, pulled pork and beef brisket. Sides feature blue cheese and bacon potato salad, jicama slaw, heirloom beans and mac and cheese; try the biscuit cobbler for dessert. Lunch & Dinner daily. Horse Thief, Grand Central Market, 324 S. Hill St., Los Angeles, CA 90013, 213-625-0341. Acabar has taken over the space previously occupied by restaurant Dar Maghreb. This dimly lit restaurant-lounge transports you through a selection of small sharable plates with culinary influences that include Morocco, the French West Indies, Southeast Asia and India, among others. Acabar, 1510 N. Stanley Ave., West Hollywood, CA 90046, 323-876-1400. 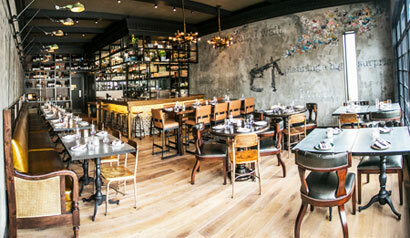 Co-owners Jed Sanford and chef Tin Vuong (Abigaile) have launched Little Sister in Manhattan Beach. The Southeast Asian menu is seasonal, but expect the likes of charred sugar cane shrimp and Vietnamese coconut chicken curry. Little Sister, 1131 Manhattan Ave., Manhattan Beach, CA 90266, 310-545-2096. Popular Santa Monica Farmers' Market bakers Rose and David Lawrence have opened a brick-and-mortar bakery/café in Culver City, Red Bread Market & Café, now open for breakfast, lunch and tea four days a week. Find quiche, sandwiches, tartines, daily special pastries, artisan breads like “wild sourdough” and Russian black bread fermented with natural leavens, along with cookies, scones and homemade organic jams. Breakfast & Lunch Wed.-Sat. Red Bread Market & Café, 13322 W. Washington Blvd., Culver City, CA 90066, 424-272-5752. Chef Hans Röckenwagner will launch his new sibling of 3 Square Café in Brentwood. The 1,500-square-foot space will feature a bar and a large patio, and will serve breakfast, lunch and dinner. The menu will be similar to the original Venice location, featuring California salads and burgers, as well as Austrian specialties like goulash with spatzle, chicken schnitzel and wild boar stew. 3 Square Café, 1168 S. Barrington Ave., Los Angeles, CA 90049, no phone. Chef Perry Cheung (The Slanted Door, San Francisco) has opened Phorage in the former Westside Chego space on Overland Avenue. Expect a higher-end traditional pho made with local produce and sustainable meats, and a Vietnamese menu featuring banh mi sandwiches, broken rice dishes, cold noodle salads, spring rolls and Vietnamese crepes. Lunch & Dinner Mon.-Sat. Phorage, 3300 Overland Ave., Culver City, CA 90034, 310-876-0910. In Toluca Lake, Scott Kay’s (Wood & Vine) Spin The Bottle Wine Studio will open this fall. The retail wine shop/wine bar will offer a by-the-glass menu at the wine bar, with several wines on tap, and charcuterie from chef Gavin Mills (formerly of Wood & Vine). The space will also feature local art work. Spin The Bottle Wine Studio, 10139 Riverside Dr., Toluca Lake, CA 91602, no phone. Chef Joachim Splichal and Patina are celebrating their move a decade ago to the iconic Walt Disney Concert Hall in 2003 with a special retrospective 10-Year Tastings Menu this fall. The restaurant will host a guest chef series of celebrated past Patina alumni. Patina, Walt Disney Concert Hall, 141 S. Grand Ave., Los Angeles, CA 90012, 213-972-3331. Ray’s & Stark Bar at the Los Angeles County Museum of Art has launched L.A.’s most extensive water menu, with 20 varietals of water from around the world. Conceptualized by GM Martin Riese, (the world’s foremost certified water sommelier from the German Mineral Water Association) the water menu includes many mineral waters that are rarely found in the United States, featuring an entire page for each varietal, which is complete with tasting notes, mineral content, bottle price and photos. Guests may choose from carefully chosen waters spanning 10 countries, including Badoit from France, Vichy Catalan from Spain, and Riese’s own Beverly Hills 9OH2O. Though each water is available for sale by the bottle, Riese also offers guests a tasting menu for $12. Ray’s & Stark Bar, Los Angeles County Museum of Art, 5905 Wilshire Blvd., Los Angeles, CA 90036, 323-857-6180. Chef/owner Jessica Koslow has expanded her Eastside hipster-centric Sqirl space, adding 20 seats, new flooring, and replacing the somewhat unpopular wooden crate tables with marble tabletops. Sqirl, 720 N. Virgil Ave., Ste. 4, Los Angeles, CA 90029, 213-394-6526. Executive chef Jonathan Moulton has unveiled a new menu at Sadie, which includes mole-rubbed New York steak, bourbon-glazed ham chop, and Moroccan spiced octopus. Mixologist Giovanni Martinez shakes up a new Negroni Sour made with Oxley gin and stinging nettle cordial, as well as the Kentucky Ninja featuring Japanese single-malt whisky, bourbon, fresh lemon juice, lavender-infused wild honey and served in a Peychaud’s Bitters-rinsed glass. Sadie, 1638 N. Las Palmas Ave., Los Angeles, CA 90028, 323-467-0200. Cube’s executive chef Erin Eastland has moved over to helm the stoves (and pizza oven) at Milo & Olive. Sous chef Duke Gervais is now in charge at Cube. Milo & Olive, 2723 Wilshire Blvd., Santa Monica, CA 90403, 310-453-6776. In West Hollywood, BLT Steak has closed after five years. A new restaurant concept in the space will be announced soon. BLT Steak, 8720 W. Sunset Blvd., West Hollywood, CA 90069, no phone. Chef/owner Michael Young has announced the closing of his restaurant, Ombra Ristorante, in Studio City, following a two-year run. Final service will take place Friday, September 6. Ombra Ristorante, 3737 Cahuenga Blvd., Studio City, CA 91604, 818-985-7337. Chez Soi at the Metlox Plaza in Manhattan Beach has shuttered. The restaurant opened in April 2013 as a collaboration between Thierry Perez (Fraiche, L'Epicerie Market) and Mark Gold (Eva). Chez Soi, Metlox Plaza, 451 Manhattan Beach Blvd., Manhattan Beach, CA 90266, no phone. Lola's will close its doors after brunch service on September 8, 2013. The West Hollywood spot is known for its selection of martinis. Lola's, 945 N. Fairfax Ave., West Hollywood, CA 90046, 323-654-5652. Less than a year after opening, 9 Olives at Chaplin House has closed. Chef Kevin O’Connell is reported to be turning the space into a tapas bar and lounge tentatively named Punk’s, set to open in early autumn. 9 Olives at Chaplin House, 8210 W. Sunset Blvd., West Hollywood, CA 90046, no phone.